Although it has certainly felt like it's already here, summer officially arrives this week. WASHINGTON — Although it has certainly felt like it’s already here, summer officially arrives this week. The solstice will be at 12:24 a.m. EDT Wednesday. It will be a rather pleasant day, but we have to get rid of the current weather situation first. We will do so, but we’ll have to pay the price in the form of some strong thunderstorms Monday afternoon and evening. It will be a Storm Team 4 Weather Alert Day for the severe weather potential. Monday starts off already very warm, very humid and muggy. Dew point temperatures will generally be in the low 70s, which is pretty high for our part of the country, so it will feel pretty uncomfortable. Air temperatures will also have already been in the upper 70s, so a little bit of sunshine in the morning will make temperatures rise very quickly. The atmosphere will be quite unstable and “energized” as a strong cold front heads through during the afternoon. It looks like a line of storms will accompany the front, as opposed to scattered activity. A flash flood watch is in effect for parts of D.C., Maryland and Virginia from 3 p.m. through the evening. See which areas are under watch on WTOP’s Weather page. Confidence is high that we’ll all see thunderstorms; it’s just a matter of how strong they get. The primary threat will be very heavy rainfall, but damaging winds and large hail can’t be ruled out. The most likely areas to see the strongest storms will be where the front coincides with maximum daytime heating: mainly east of US-15 and north of Interstate 66, up through northern and eastern Maryland and farther north into New England. The timeline, or “window of opportunity” for the storms, will generally be 2-8 p.m., as of the publication time of this blog. 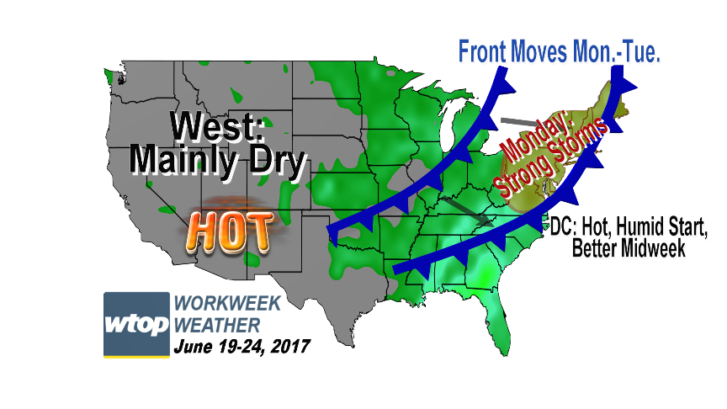 On Wednesday, a weak ridge of high pressure will pass through, keeping it dry and mostly clear. But southwesterly winds will send a warm front our way Wednesday night and Thursday when the high moves away, and that will start sending the heat and humidity back for the rest of the week, along with chances for scattered thunderstorms. Even though the drought is officially over, June has not seen a lot of rainfall. At Reagan National Airport, we are almost at 2 inches of rainfall below average for the month of June and a little over 3 inches below for the year. So while flash flooding on Monday would not be welcome nor is any other storm damage, the topsoil, gardens and lawns could use the watering.